Take to the floor with these brightly coloured tiles if you're looking for a fresh, welcoming look in your kitchen, bathroom or hallway. Whether porcelain, ceramic, or encaustic, patterned tiles instantly add character and texture to a space, and are easy to clean. Before you get started, it's important to make sure that you know how to choose floor tiles, as there are several factors you'll need to consider. Once you've figured out what type of floor tiles you need, decide on the style you want. Whether you're recreating an authentic, Victorian-inspired look or aiming for something more contemporary, there's something to suit every style of interior in our gallery of floor tile designs. Perfect for a more contemporary setting and allowing plenty of scope for creativity in how you arrange the porcelain tiles, Moon Deco Pink by Realonda comes in 10 striking designs with four patterned and two plain colours, from around £16 per m2, from Tile Expert. In on-trend shades of grey, cream and black, but with style references rooted in ancient heraldry and fleur de lis designs, the Florence Décor 7/7 collection of patterned porcelain tiles comes in four base colours and seven decor designs. The designs can be used alone or combined to great effect. Priced at £59.49 per m2 from Mandarin Stone and suitable for walls and floors. The mesmerising geometric patterns in Original Style’s Lewtrenchard Denim and Dark Grey porcelain tiles will look equally good in a kitchen, bathroom or hallway. The tiles from the Odyssey Grande collection cost £79.95 per m2. The antiqued finish and colourful floral design make this a good choice for period homes. Create a vintage look in a bathroom, hallway or conservatory with these matte-finish ceramic Cynosure tiles, priced at £29.95 per m2 from Walls & Floors. The cool geometric design of the Compass tile by Alhambra is bound to bring a breath of fresh air to any room scheme with its bold shapes in elegant monochrome. It costs £38.25 per m2, and come in a choice of pink or blue accents. Taking its inspiration from French provincial style, the new Riga tile range from Tile Mountain is guaranteed to be a hit. Its eye-catching patchwork shape adds a unique focal point in any room. Comprising of thirty two pattern variants in eight combinations, you can create a design unique to your home. With a matt finish the tiles measure 450mm x 450mm and are priced at £16.99 per sq m.
The Lenos Mirabello from Peronda’s Onset range fuses industrial and vintage styles and would work beautifully as a way of adding contemporary chic to a period setting. Priced at £45.80 per m2. Fired Earth’s Amparo handmade encaustic tile can be mixed and matched with others in the Madeira range to conjure dreams of Mediterranean sunshine with its soft blues and greens. Priced at £195 per m2, the Madeira range can be used for floors and walls. Add soft shades and interesting texture to your kitchen with decorative wall and floor tiles. 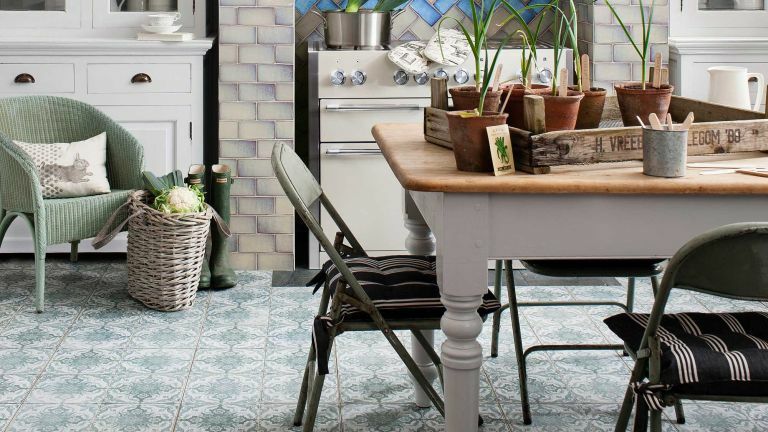 With subtle and varied reactive glazes, Topps Tiles' Shibori wall tiles in cream, blue and green, £90.67 per m2, can be arranged in a variety of configurations to create a calming watery effect, while the patterned York floor tiles, £59.95 per m2, add a touch of nostalgic fun. Fall in love with the glorious aged patina of Old Faro porcelain tiles from Lapicida. The simple pattern in exquisitely faded shades of blue will make a stunning focal point of any wall or floor. Priced at £70.80 per m2. Create your own eye-catching designs with Topps Tiles’ Stamford large format patchwork tiles, which complement each other in any combination. Each whole 45x45cm tile is made up of four smaller designs giving the impression of a four pattern tile mix. Priced £55 per m2 for a mixed pack. With its pretty, retro design in contemporary teal shades, Ca’Pietra’s Cordoba encaustic tile (four shown) is a great option for hallways. The tiles are suitable for walls and floors and cost £96 per m2. A good option for Mid-century modern interiors, Concept by Cas Ceramica is available in five designs and 11 colours. The satin-finish ceramic tiles would make a bold statement for kitchen or bathroom walls or floors, and are priced at £40 per m2. Stone & Ceramic Warehouse's decorative Parisienne range includes this pretty Cleo porcelain patterned tile. Team it with others in the range, or with plain tiles for a stunning feature floor. Priced at £65 per m2. Mix and match British Ceramic Tile’s four Moroccan-style Parian tiles to create a colourful patchwork effect guaranteed to brighten the day and lighten the mood. The tiles are sold in a mixed box of 22, £78 per m2 and can be used alongside the matching plain cream Parian tiles for more contemporary styling, and for walls or floors.